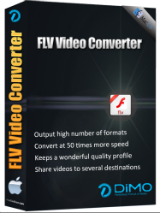 L'offre gratuite du jour pour Dimo FLV Converter 4.2.0 (Win & Mac) était valable le 15 juillet 2018! Votre outil indispensable pour le traitement vidéo FLV SD / HD / 4K - éditer, convertir, redimensionner et partager les fichiers FLV (par exemple FLV en MP4, FLV en MP3, FLV en iPad, etc.). 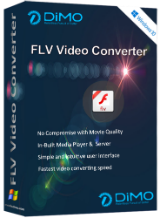 Convertit les FLV en formats vidéo comme MP4, H.265, AVI, etc. et extrait l'audio en MP3, AAC, etc. Personnalisez FLV en ajustant la luminosité / le contraste / la saturation, en recadrant, en ajoutant un filigrane, etc. Votre meilleur convertisseur vidéo Mac FLV pour convertir les formats FLV en formats plus populaires, convertir les vidéos FLV en iPhone, iPad, Android, PS4, VR, etc. Considering this is based on the open source FFmpeg which accepts dozens of input formats, you have to question Dimo's motives for releasing different shareware converters that accept only one or two input formats at a time. Jeff Dalls, every single similar video converter, from this or any other other publisher, is a shell wrapped around the open source and pretty terrific FFmpeg. Programs like this will continue to be released because people are not comfortable with a CLI (command line interface), which is how you control FFmpeg. Jeff Dalls, every single similar video converter, from this or any other other publisher, is a shell wrapped around the open source and pretty terrific FFmpeg. Programs like this will continue to be released because people are not comfortable with a CLI (command line interface), which is how you control FFmpeg. Pointless having a converter that only accepts one input format. This is a joke, or am I missing something? Boring I mean how many converters are out there & how many do you need? Give us more iTunes & photo apps or utilities. I realized that everyone is different but how about programs like Media Monkey Gold or ACDSee Photo?